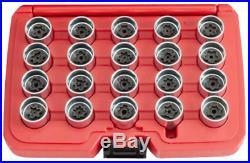 Audi Locking Wheel Nut Key Set T&E Tools T65077. These sockets enable you to permit the removal of the security wheel lock nuts for servicing of customer vehicles, even if customer has lost the security socket. Sizes: A(801), B(802), C(803), D(804), E(805), F(806), G(807), H (808), J(809), L(810), M(811), N(812), O(814), P(813), R(815), S(816), T(817), V(818), W(819), X(820). Audi Locking Wheel Nut Key Set T&E Tools T65077" is in sale since Monday, December 04, 2017. This item is in the category "Vehicle Parts & Accessories\Automotive Tools & Supplies\Hand Tools\Other Automotive Hand Tools". The seller is "snparts14" and is located in Kiama. This item can be shipped worldwide.